Yeah, it happened to me, too — that weird summer, when everything that I drew on a sketchpad came to life. 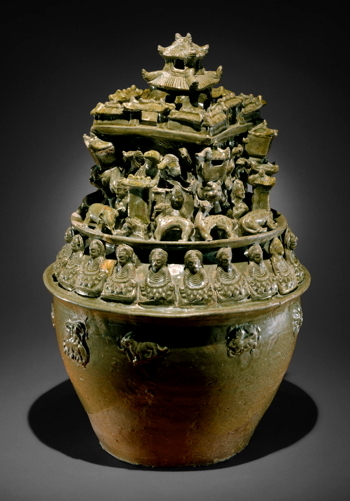 I remember how it started: I was drawing a picture of a Chinese funerary urn, kind of squat stoneware with an olive green glaze, maybe 3rd century, Western Jin dynasty, with a balcony of molded figures around the rim, like a tortoise supporting a memorial stone, some bears and monkeys and immortals riding dragons, plus a row of Buddhas sitting in meditative postures on thrones surrounded by lotus petals — you know, just doodling — and all of a sudden, I look up, and there it is on the table. Seriously. The funerary urn that I’d scribbled on the drawing pad. It was right there, just like I drew it — bears, Buddhas, Western Jin, the whole shebang. Well, I was stunned, obviously. I didn’t think it was possible. I had to see if it would happen again, so I drew another funerary urn — this time with more bears on it, just to make sure — and when I looked up, there they were. The two urns that I’d sketched, three-dimensional and big as life. Naturally, after a while, I got tired of funerary urns — I probably had about three dozen by that point, and things were getting cluttered around the house — and I figured maybe I should try and draw something else. So I drew a guy. And then there he was, in the room with me: a new man. Maybe five foot nine, brown eyes, dark skin, one ear a little bigger than the other. Not really up on current events. I mean, you know what human beings are like. He was one of those. He turned out to be a nice guy. A lot of birthdays to catch up on, obviously, so I had to scrounge up some last-minute presents. I was hoping he would take some of these funerary urns off my hands, but no dice. Getting him a social security number was a hassle, too. After a while, we kind of lost touch. You know how it is sometimes, you drift apart. God, I haven’t thought about him in forever. I wonder how he’s doing. Anyway, Charles Delaware Tate has been going through the same phase lately, gifted with a mysterious power that he doesn’t want and can’t control. A couple years ago, he painted a woman that he dreamed up, and now he’s learned that the woman came to life at that moment, walking around on the streets of New York, with no memory or identity. It calls itself Amanda Harris. Tate is played by Roger Davis, so obviously he’s petulant and bossy about everything. 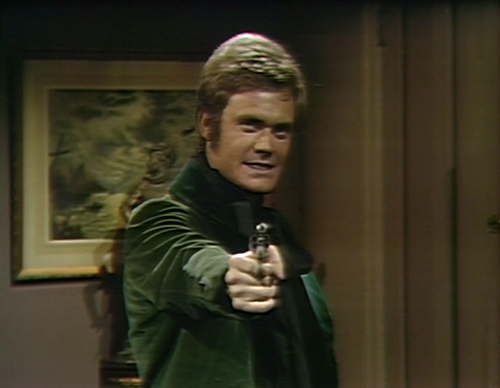 This is Roger’s fifth character on Dark Shadows, and they just keep on getting more unpleasant. Tate scowls and shouts, and as far as I can tell, he loathes every single person that he interacts with. Right now, he’s confronting Amanda with the truth about her uncanny existence, which she naturally finds a little hard to accept, so he just browbeats her about it. He grabs her forearm, and whirls her around to face him, barking, “No, you came here to find out if I told you the truth!” Roger Davis characters tend to express themselves by repositioning females. Unfortunately, Roger Davis isn’t giving us a lot of information about why this situation makes him so upset. Yes, this is obviously a confusing and stressful moment, but it would be helpful if he could make some acting choices that help us to narrow that down. There are several options that he could choose from. He’s breaking some fundamental laws of nature, for one thing, and the religious implications are unclear. He doesn’t know whether his powers come from God, or the Devil, or some dark and ancient magic that will extract a terrible price. He’s got to be wondering if this is all a dream, or if he’s gone insane. Plus, if anyone finds out, he could end up in somebody’s laboratory, or he could be exploited by some unscrupulous villain. Also, there’s something wrong with physics, and that kind of thing can get messy. But Roger doesn’t really indicate which of those fears are in play. As an actor, the only choice that he ever makes is whether to be sullen or enraged, and even that’s just a question of volume. “Look, I’ve SEEN it!” he growls. “And I’ll show you!” Then he grabs a sketchpad and starts scribbling. I don’t know why he does this. It’s just going to make things worse, and they’re already worse. So he draws a man that he’s never seen before, just to see what happens, and guess what. Here he is, a brand new character! He doesn’t have a name yet, but I bet it’s Henry; he looks like a Henry to me. Or we could go for the traditional option, and call him Amanda Harris. This makes Tate even more incandescently furious than before. I don’t know why he’s so pissy about this — it was his bright idea to create the guy, just to score points in an argument. If he doesn’t want any more people on his hands, then he should step away from the sketchpad. It’s like the funerary urns; at a certain point, you decide to develop other interests. Amanda takes off — apparently, she just remembered an appointment, or something — and Tate is left alone with his new friend. Faced with an inhuman entity of his own design, Tate makes another unusual choice. 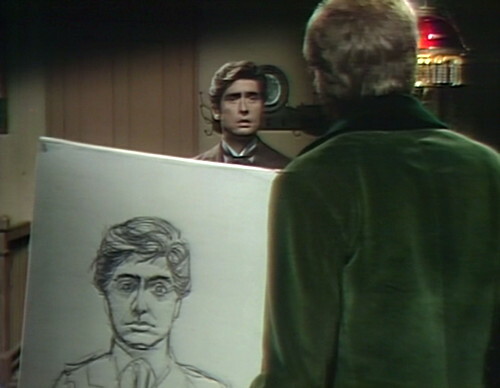 “All RIGHT!” he shouts, and raises the sketchpad above his head, confronting Henry with his own image. Naturally, this confuses Henry; it would confuse anyone. He’s only been here about thirty seconds, which hasn’t given him a lot of time to study the nuances of body language. You have to feel for the guy. Imagine being created spontaneously out of thin air and graphite, and the only person you’ve ever met is a Roger Davis character. “I created you,” Tate shouts, advancing on the guy, “and I can DESTROY you!” Henry doesn’t know what to do with this information. This is one of the all-time confusing birthday parties. Then Tate tears the paper in half, which has no visible effect. Now he needs a step two. Next, Tate grabs Henry by the arms and shakes him, hollering, “What are you? WHAT ARE YOU?” which is weird, because usually Roger Davis only does this with women. I guess he’s trying to broaden his range. So this is a thing that Dark Shadows does now, it introduces characters who have almost nothing to do with the rest of the story, and then grants them magical powers that they didn’t realize they had. The show’s been crazy for a while, but I don’t think they’ve done anything quite like this before. 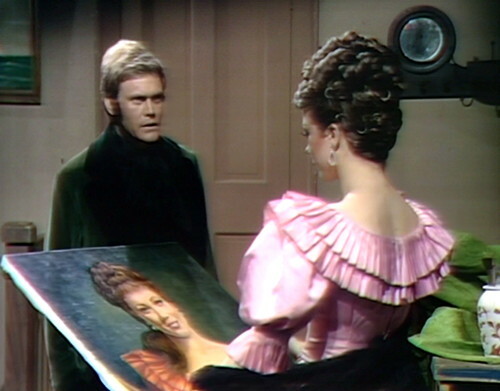 The writers introduced Tate for a specific plot function — they needed somebody to paint Quentin’s magical Dorian Gray portrait, at Count Petofi’s instruction. But now, it’s like they’re saying, hey, wouldn’t it be funny if this peripheral character had some dark magic of his own? 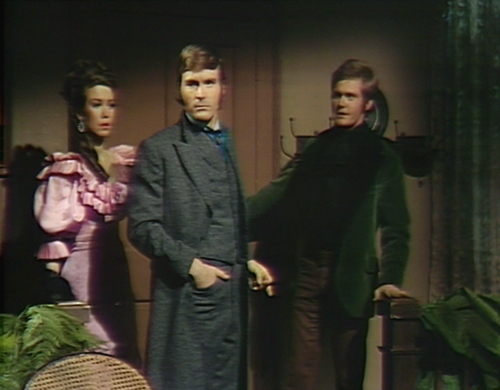 And they’ve just let this little B-plot develop in the background over the last month, kind of a short story they’ve been noodling on while the important characters get on with the business of making Dark Shadows. 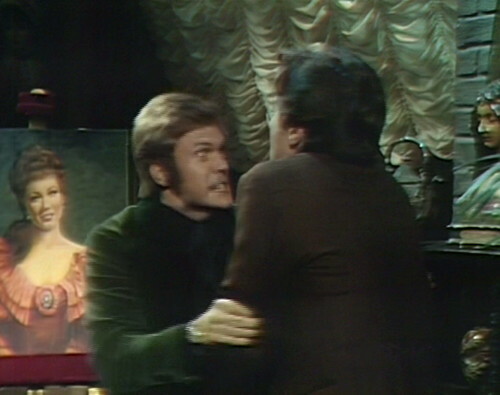 The really odd thing about this little plot thread is that it’s obvious Count Petofi imbued Tate with this power — that’s the only way to understand why he asked Tate to paint Quentin’s portrait — but Petofi doesn’t actually know about this power at all. They’ve suggested that several times, and it’s confirmed in tomorrow’s episode, when Tim Shaw tells Petofi about this, and it comes as a surprise. I don’t know what the hell’s going on, which I suppose is the purpose of Dark Shadows, so hooray, another victory over common sense. And then speaking of Tim Shaw, ugh, here he is. Amanda ran back to their hotel suite and told him about Tate’s cordless 3D printer, and Tim said, “Amanda, you and I are going to pay a little visit to Mr. Tate,” because Tim thinks that he’s crafty now. It’s awful. I honestly have a hard time explaining my enduring dislike of Tim Shaw. I wrote about him when he first showed up as a prissy schoolmaster at Reverend Trask’s punishment school, and his flaws at the time were as follows: a ridiculous haircut, a craven attitude towards his tremendously evil boss, no sense of humor, and a penchant for lecturing children about their schoolwork. Also, when he reads a book, he licks his finger before turning the page, which is unsanitary, and profusely annoying to watch. But then he stole a magical artifact and ran away to New York for a while, and when he came back, he was basically a new character — a different haircut, a more confident personality, new clothes, and more story-productive plot contributions. I haven’t seen him read a book lately, so I don’t know about the finger-licking thing, but even without that, it’s a hundred percent improvement. And yet I still hate him, just as much as before. I can’t figure it out. I guess the key problem is that he acts super smug about everything, like he’s the man with the golden touch who can see opportunity anywhere, but he’s been here a whole month, and the only thing that he’s done is to send his girlfriend to go live in a mansion where she makes out with Quentin Collins. Tim wants to see Henry, but Tate’s locked him up in the closet, and he’s claiming there’s no such person. But Amanda sees the closet’s doorknob turn back and forth, and Tim reaches into his pocket and pulls out a gun. 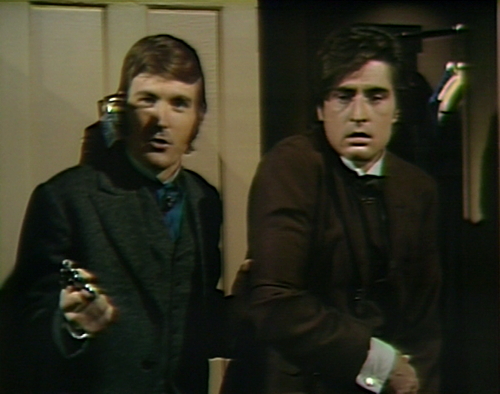 Yes, of course he has a gun; everybody on Dark Shadows has a gun. In fact, I think it’s the same gun. Tim asks Tate for the key to the closet, but Tate says he doesn’t have one. “Mister Tate,” Tim smirks, “I have a gun. Surely, you have a key.” Except the way he says it, it’s even more douchey than you think. Ugggh, Tim Shaw, you are terrible. Now, if life was like a Tex Avery cartoon, and I think we can all agree that it should be, then Tate’s next move would be to grab his sketchpad and draw an even bigger gun. Then Tim would reach into his pocket and pull out a machine gun, and Tate would draw a rocket launcher, and we could go back and forth like that until somebody pushes down on a plunger detonator, and there’s an explosion that cracks the Earth in two. That would be a good scene. Instead, Tim walks to the closet and pulls out Henry, and then they do a really odd thing. Tim looks straight at the camera, pointing the gun in our direction, and he says his lines as if he’s talking directly to Tate. This is a weird directorial technique that I don’t believe they’ve tried before. It doesn’t work, because we have object permanence, and we know where the closet is, in relation to where Tate is standing. It’s clearly not an accident — there was a very quick shot like this earlier in the scene, and they do it again at the end of the episode. I think they’ve been having so much fun with Count Petofi’s habit of staring directly into the camera every time he talks that they’ve decided to see if there’s anything else they can do in that area. So Tim says his lines, and then he turns and walks over to Tate, who’s standing right in the spot where we thought he was. It’s really quite baffling. Eventually, Tim takes Henry away with him, which at least makes the scene fifty percent better, but we’re still left with Tate and Amanda, so it’s hard to appreciate the improvement. Amanda is doing her best, sitting on the couch and saying her lines, but Roger Davis is so relentlessly awful that he’s making it difficult for her. He’s trying to tell her that she’s not just a facsimile creature, but a real woman, and he’s illustrating his point in a tactile way. “You can touch,” he says, touching her face, “and you can feel,” he says, feeling on her hands. She turns away, and he actually reaches out and grabs her chin, rotating it forty-five degrees, so that she’s facing him again. “And you can love,” he breathes, keeping a firm grip, until she finally bats his hands away and stands up. He stands up too, and over the course of the next twenty seconds, he touches her face three more times. Honestly, why do they keep letting Roger Davis have access to women? So it ends the way things always end, I suppose, in blood and thunder. Tate goes over to Tim’s hotel room with a gun, obviously, because ABC Studio 16 is an open carry state, and he threatens to kill Henry, except he points the gun at us, rather than aiming at the place where we know Henry is, namely: several feet to our left. 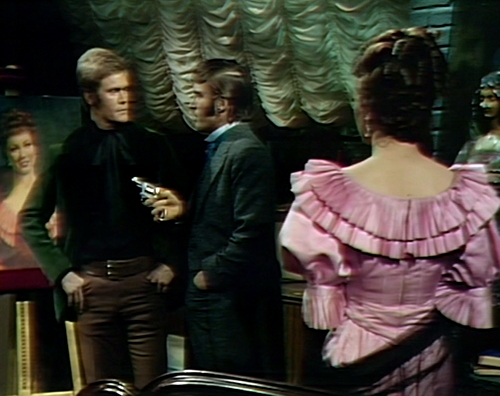 I don’t really know why the stars of Dark Shadows are so determined to hold us at gunpoint today; maybe they’re trying to keep us from changing the channel. It’s domestic terrorism, really, and if it wasn’t for the Second Amendment, I’d draw a policeman and file a complaint. In the opening shot of Collinwood, the word “SHADOWS” is written across the bottom of the screen. There’s a burst of studio noise when the scene shifts from Beth and Petofi in the mill to Amanda and Tate. When Petofi stops Beth from leaving the mill, he pauses with his mouth open for five seconds before he says the next line. During a pause in Tim’s rant at Tate’s creation, you can hear somebody rattling the I Ching wands in the studio. Probably a good thing Tate didn’t sketch the kind of things H P Lovecraft talked about. That might have gone over budget. Well, he could have painted some modern art… Some abstract figures. Or even better, a Jackson Pollock derivation… That I’d liked to see them animate. If Tate really wanted to be free of Petofi and all the woe such an association has apparently brought him, he could just sketch himself a suitcase full of money and travel far, far away. But there are so many women to grab hold of in the area that he just winds up staying in Collinsport. Perhaps the vases would fetch a fair price in a local antique shop. As for actors talking directly at the camera, this has been done before, a couple of times in 1967 during the Phoenix storyline. 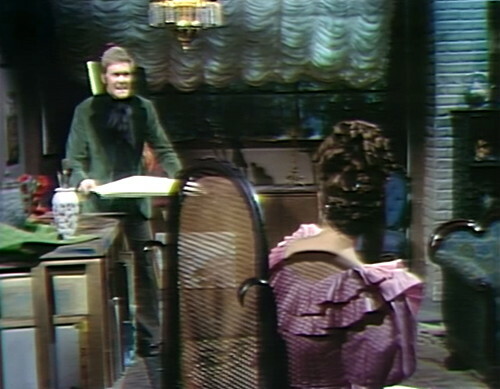 When Roger stands in the drawing room with Vicki and Carolyn and reprimands Carolyn over his rights regarding decisions relating to his own son while she is temporarily in charge of the estate while Liz is away, he does so reading off the teleprompter the entire time, a full and sundry paragraph of Louisisms delivered without even so much as a glance in Carolyn’s direction, who is out of camera shot to his left. Another time this is done is also in the drawing room, this time when Joan Bennett faces the teleprompter for the entirety of several lengthy consecutive lines spoken to Vicki, who stands to Liz’s left as though making eye contact as Liz speaks to her but stares unflinchingly at the camera the whole while. I’d hardly call the forgetting of or failing to learn properly one’s lines a “directorial technique”. But I love it anyway — such moments lend an unmistakable uniqueness to the show. Fourth wall convention? Like the shrubs and gravestones, that wall tends to wobble a bit. 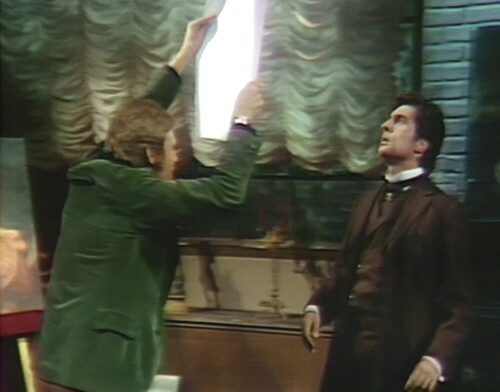 Thank goodness for tight budgets and expensive tape — another reason why Dark Shadows could only happen once. Yes, I would agree in Thayer David’s case that it is no doubt quite deliberate, the talking at the camera and so on, for effect. But Mr. Briscoe by this point, he needs the help from the teleprompter. He’s getting to be… quite pointless. His character is going nowhere. As to the matter of Tim Shaw… perhaps I can offer some insight as to why he seems so unappealing, and why he’ll become increasingly so in upcoming episodes. Early on, he had something to fight — that is, Evan Hanley, forcing him to do things he found distasteful, being oppressed by Gregory Trask. There was an audience identification — where he was being coerced into doing things he didn’t want to do. You wanted him to prevail somehow above the dark forces that were manipulating him. But now, it seems that whenever there is something going on, wherever he gets to ask “What’s in it for me?”, then he’s there, ready to dip his fingers right in it. He’s become a one-dimensional opportunist not so much as a mover of plot points, but instead just to emphasize that something unseemly is going on and that he should be right in the middle of it, but somehow never is. Is this the Tim Shaw we were introduced to, the Tim Shaw who was unfairly indebted to Gregory Trask in that Dickheadsian [Dickensian] school? Suddenly Shaw is no longer the victim, but instead an opportunistic victimizer. He wants to call the shots, but he is just too reckless, inept even. Even worse, his hair gets greasier as we go along. On second thought, perhaps you’re right. I mean, definitely in the case of Charles Tate it’s a blocking decision — but in that instance he’s directly addressing another character, and the camera gives us the point of view of the character Tate is addressing. But with Tim Shaw, there is no character in his line of sight, just the teleprompter, where his eyes seem to be focusing and he isn’t definitively pointing the gun at the viewer the way Tate would later on. But I suppose I’ll give him the benefit of the doubt for now — I just keep trying to gauge Don Briscoe’s downward spiral, and since Tim Shaw’s first scene with Amanda Harris, he’s been relying on the teleprompter with increasing frequency and his overall performance just seems to be getting flat and aimless. He could also keep drawing beautiful women til he made one that could stand him. …lol….you guys are too funny on this episode…lol…@ drawing a woman that could stand him. As for Tate continuing to try to sketch women until he can create one that can stand him; I wonder if there’s that much art media in the world. If “Henry” = Rocky Horror, does that make Charles Delaware Tate Dr. Frank N. Furter? When CDT says he can draw a crowd, he ain’t kidding! Anyone who can rock a green velvet smoking jacket like that can’t be all bad. I always loved how Petofi was unaware, sometimes, of his own powers. Hilarious blog entry this day. yes Petofi was not the most attractive guy going on here. Perhaps he could change his hair and get rid of that afro and get a cold wave. Late to the party here but between the hammy Davis and the smug Briscoe, Terry Crawford looked great by comparison today. 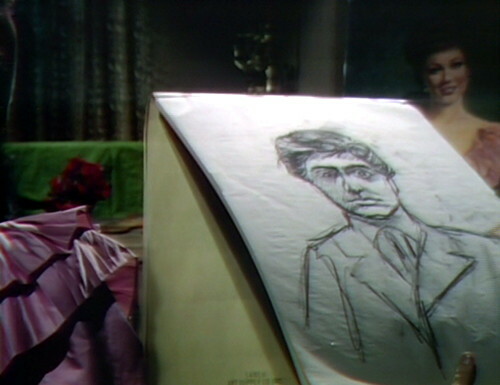 While watching the episode, and knowing she went on to more career success, I was wondering what the show would have been like if Donna McKechnie had been cast as Victoria Winters back in 1966 or had been one of the recasts – would the character have lasted the duration of DS? The illustrated man manages to out-act both Roger Davis and Don Briscoe without a single line. Handsome, well-dressed, doesn’t talk, submissive, living in a closet – was Tate sketching his ideal man? Anyone else noticed that since the “Portrait of Amanda” started getting a lot of airtime, that the actual Amanda only seems to be wearing the dress and hairstyle from the painting? Just so we’ll match the two up?